A young dog with a very balance temperament and guard instinct, this has a well-toned and slender physique. He had spent the formation period in a family and well exposed to protection and bite work training. Though very confident, he is always very alert and vary of this environment. He makes a good guard and a family dog. The pictures below were taken when he was in Germany. You can also view the SV pedigree in the same picture gallery below. Very active and full of energy, the videos below are a glimpse of high play drive which can be built upon for advanced obedience work. With very strong hips and elbow coupled with strong grip he is able to demonstrate sheer power during play session. 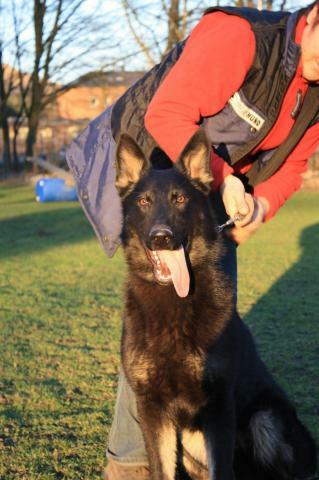 The videos below show the ball drive the dog has for play despite still new with the new handler. Just 2 days in our principal’s kennel, the dogs ability to exhibit protection work is clear visible. The dog now has been successfully handed over to the new owner and thus have settled down well with the new environment and family. Like all young dogs passing through puppy phase to adulthood there is so much boundless energy. The photos above are with the new owner. The dog is already well climatized to local weather. You can see for your on how safe the dog is amidst children despite being so powerful as a protection dog.